Nothing good can come from these white bags. I know, I know it's been a while since my last review. I did tell everyone that I was going to be away for a couple weeks, but I'm usually pretty good at writing a review when I am away in a hotel room or even at an airport before a flight, but this last trip was so busy, I didn't have a chance to stop for 30 minutes to write a review. I was able to try a bunch of new items on the trip, so hopefully the next few weeks of reviews makes up for the 2 I missed. The Potato Croquette was something I found in Singapore, and tried right before leaving on our last trip. My wife and I spend a long day walking around in the Singapore heat, and we decided to stop into a McDonald's in Bugis (that surprisingly I've never been too before), to share a McChicken set so we could use the fries to review something that my friend sent down from Japan for me to try, more on that in a future review. 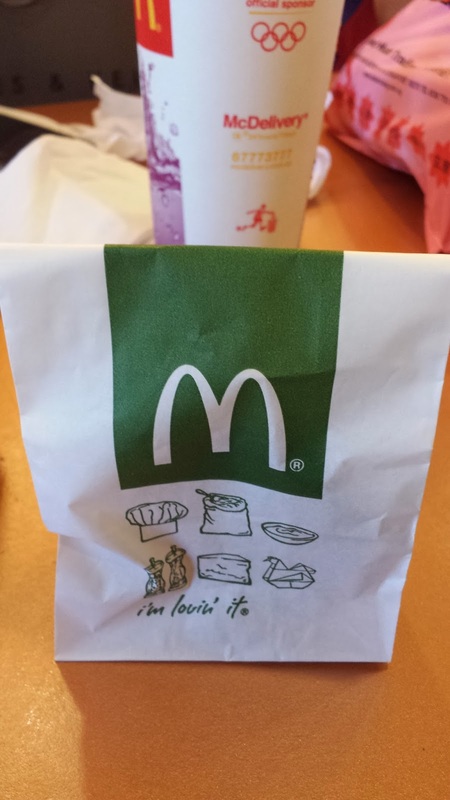 I had originally thought to try the Chicken Samurai burger, but since it was over $8 for a combo, I refused to pay that much for McDonald's when I've already had the original beef version, so we just stuck with the $4 McChicken combo. When I approached the counter, I saw a large promotional sticker on the counter advertising $1 Potato Croquettes, so I was sure to order one to give it a try. They hadn't promoted this on their main menu, nor did I see anything about it on their Facebook page or website, so it was a little strange to only see it promoted on this one single sticker. 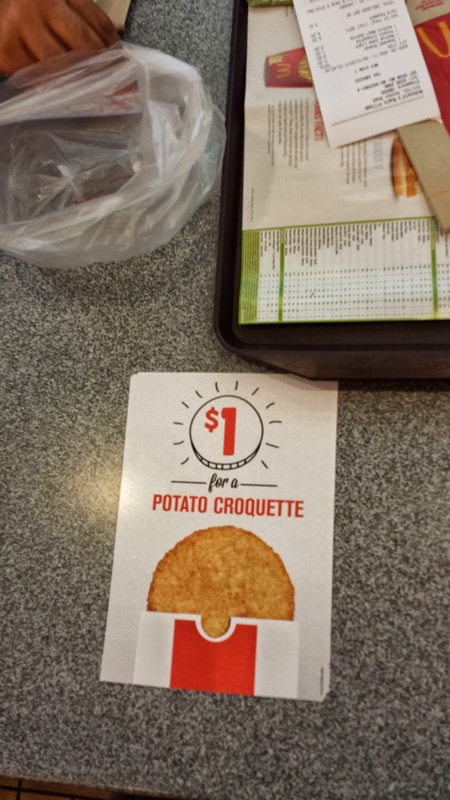 The Potato Croquette sticker on the ordering counter. I wasn't sure if the Potato Croquette is going to be a new regular menu side, or if it's one of those limited edition sides, like the Drumlets have been. Since the drumlets ran along side a promo burger and then finished when it did, I imagine if this Croquette is still for sale after the Samurai burgers finish, it might stick around permanently. I'll report back later if it does stick around, but after I took my first bite, I have a feeling I know why this wasn't heavily promoted, and don't expect this to stick around long. If you think the patty above looks familiar, you might be right. 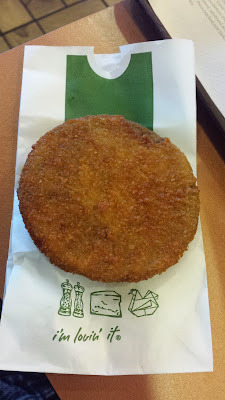 This was the same patty that was recently served on the McAloo Tikki burger, which was only discontinued with the launch of the Samurai burger. Reading other reviews online, and comments on the McDonald's Singapore Facebook page, it doesn't look like the McAloo favoured very well with the locals here in Singapore. I have a feeling these were just leftover patties from that promotion that they were looking to sell before they went off. 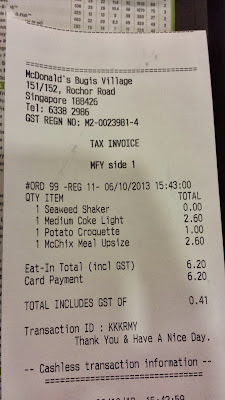 Since they were the exact same actual patty fro the McAloo, I invite you to check out that review to see more about the taste. 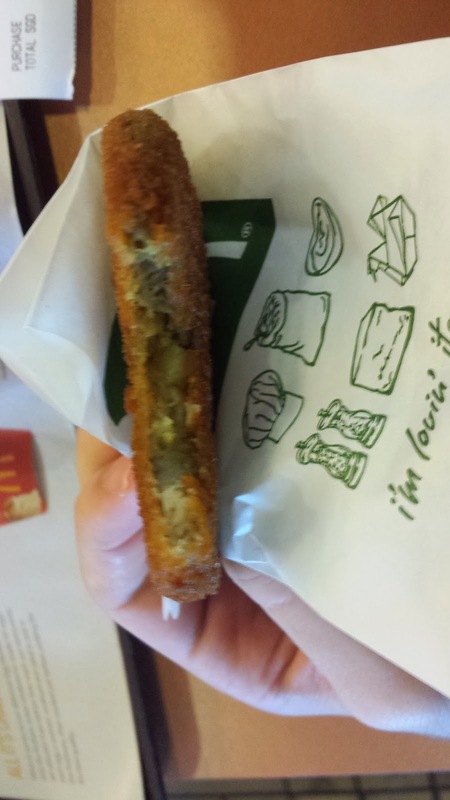 Without the bread, sauce and veggies, it was a little too dry, and you couldn't really call it a croquette. The Indian seasoning was still in there, but I felt it was a much better value (and a more filling snack as the $2 burger, instead of this $1 patty).